There are a number of different options for siding on a home, and some are much better choices than others. A lot of homes built in the 80s and early 90s have what’s called hardboard siding (not to be confused with Hardie Board siding, from James Hardie), and while it may look great for a while it can have serious problems over time. These kinds of problems include mold and rot, along with chipping, warping, swelling, discoloration, and general decay. But there are things that can be done to reduce the chances of having issues. The most important thing to be aware of is that, when this siding was installed, most of the needed protective measures were not taken. This is why hardboard siding develops many problems. Should Hardboard Siding Be Replaced? Trying to repair hardboard siding that is already badly damaged isn’t going to be successful. Instead, the siding will need to be replaced. That’s something a homeowner can either do themselves or have done by a professional, depending on how handy they are and the kinds of things they like to do. 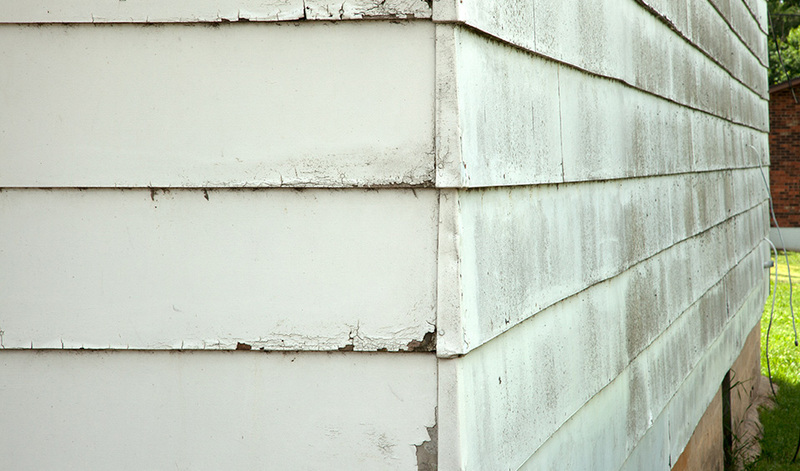 To determine whether siding has to be replaced, take a careful look for damage. Some minor damage can be stopped by protecting the siding from the intrusion of weather that’s causing the damage in the first place. But that damage can’t be reversed and will always be there, which could weaken the protection of the siding. What Kind of Siding Do You Need? If you decide to replace your siding or have a professional do it, make sure you choose the right kind for your needs. HardiePlank siding is an excellent replacement option. Unlike hardboard, HardiePlank is a fiber cement siding, so it won’t become damaged by the weather like the hardboard siding does. It’s extremely durable, holds up to weather and people, and isn’t going to swell, rot, crack, or otherwise fall apart. If you use this kind of siding on your home, it will last for many, many years without any worries on your part. That’s a great way to protect your home and your investment. Is Putting on New Siding Difficult? Having a local Chicagoland siding contractor put on new siding is the easiest way to replace the siding on your home. That way you don’t have to worry about doing any of the work, and you can just enjoy the benefits of the siding being put on your home. It’ll look great, and your house will be much better protected than it would have been with the old siding on it. If you plan to put the siding on your house on your own, you’ll want to make sure you have the right tools and the knowledge required to put the siding on properly. It has to be attached and sealed in a way that will protect the siding and the house. When you choose HardiePlank siding, though, you have less to worry about because of the ease of installation and the quality and value you’ll receive. Want to know more about your siding options? Contact Siding & Windows Group, and schedule your free, no-obligation consultation and quote today.